This recipe for Surprise Inside Pimento Cheese Tartlets is a charming, Southern recipe that bakes pimento cheese in a crispy phyllo shell with a surprise on the inside. Make them for a brunch, appetizer, or a shower and your guests will love them! 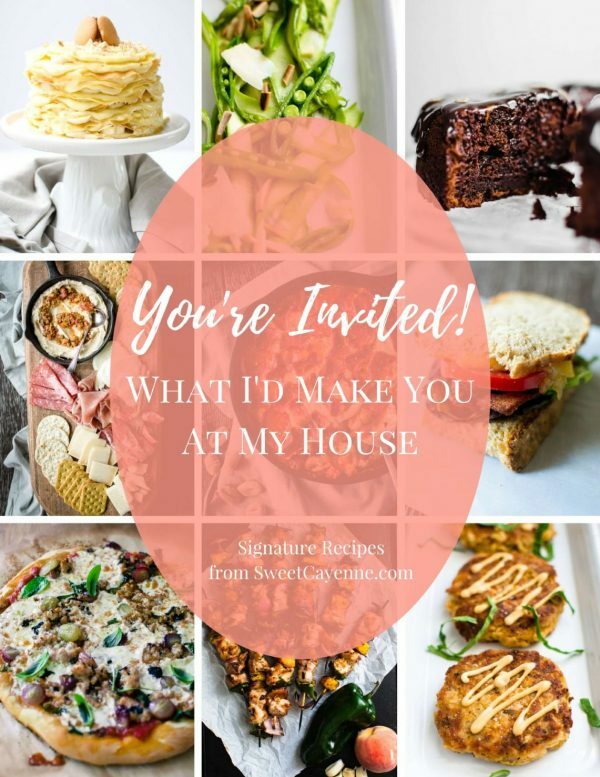 I’m going to let you in on a little secret today: I am re-posting a recipe! 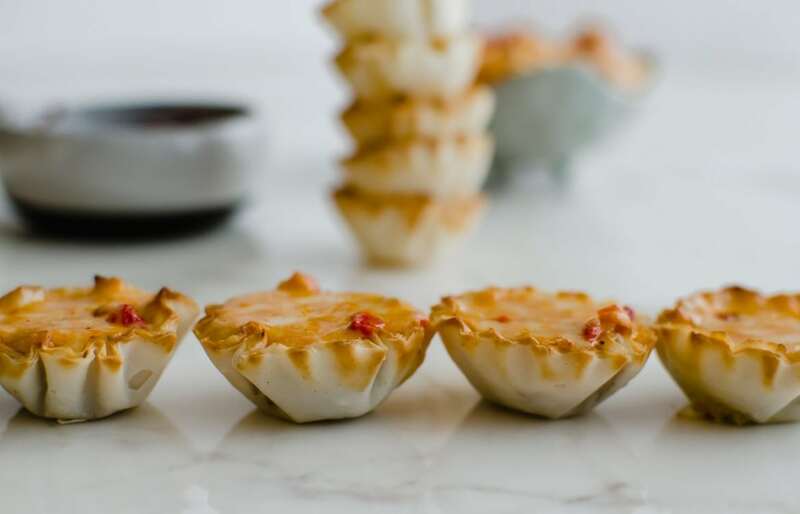 Not something I would normally do, but I’ve made these Surprise Inside Pimento Cheese Tartlets so many times and shared them with many friends since they were originally published in this post and thought it was time to give them an update! 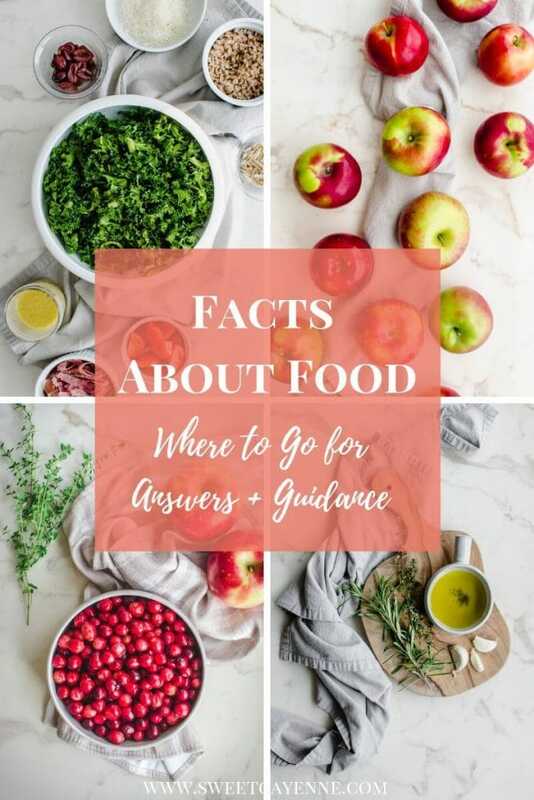 I’ve got fresh photos and a video tutorial in hopes that it will be a new introduction that will hopefully make an appearance on your Easter table! I love to make these tartlets as a brunch amuse bouche – which is typically an attempt by a host or chef to tantalize the taste palates of guests before a meal and get them excited for what’s to come. Of course, they are delightful as part of an appetizer spread, but when the tartlets get to be the star of the show while fresh and hot out of the oven, you get to experience a little magic before the meal time! Now I’m sure at this point you are thinking “what is the surprise inside?” Friends, let me introduce you to the heavenly combination of molten pimento cheese with strawberry jam. The jam is the surprise! I first had strawberry jam paired with a pimento cheese sandwich at The Chocolate Angel cafe in Dallas, TX. And ever since then, I’ve been experimenting with different ways to play up this combination. 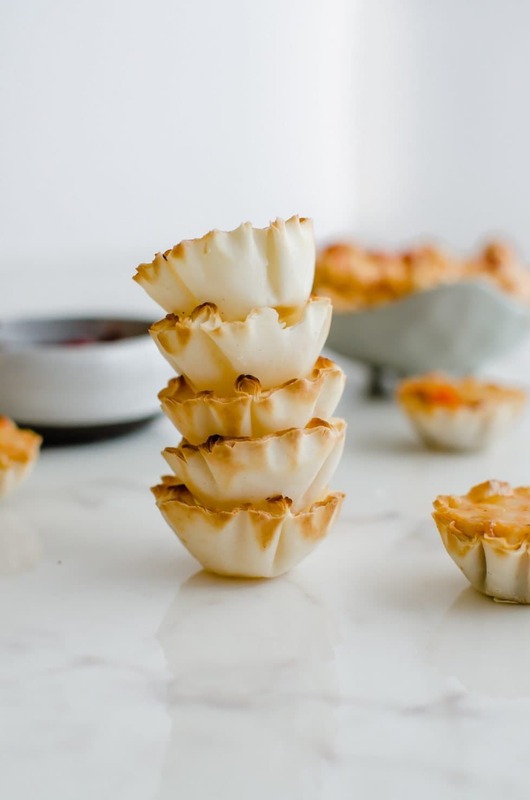 It’s one of my favorite flavor mash-ups, and I love how perfect the cheese and jam go with the delicate crunch of phyllo tart shells! Athens Mini Fillo Shells – I find these in the freezer section of most grocery stores and stock up for whenever I’m called upon to make an appetizer! Cabot Seriously Sharp White Cheddar Cheese – this is my favorite cheddar cheese. I love to snack on it and bake with it because it melts and browns beautifully. Smoked Paprika – a pantry staple that I’m constantly grabbing whenever I want a subtle smoke flavor without any spiciness. Smucker’s Fruit + Honey Strawberry Fruit Spread – an all-natural spread that is sweetened with honey instead of sugar with a huge flavor payoff. I always reach for this brand if I don’t have a homemade jam on hand. 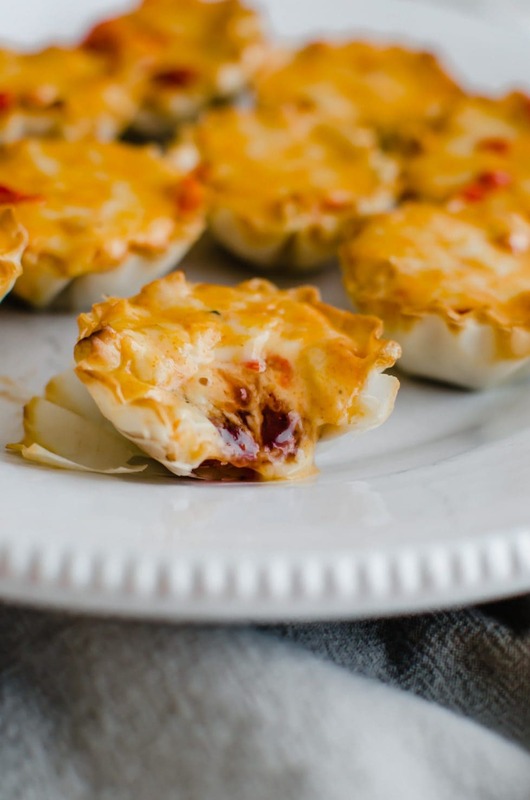 If you decide to give these Surprise Inside Pimento Cheese Tartlets a try, please let me know in the comments below. I would love to hear how they turn out for you! You can also upload a pic to Instagram or Twitter with the tag @sweetcayenne5 or find me on Pinterest at SweetCayenne5 😉 It’s always fun to connect with you! If you are in search of more springtime party recipes, check out my guide for creating the ultimate antipasto board, these Blueberry Muffins with Honeyed Oat Streusel, or this Banana Pudding Crepe Cake! Preheat oven to 350℉. Line a baking sheet with parchment paper. Set aside. In a small bowl, whisk together the mayonnaise, salt, pepper, mustard powder, smoked paprika, Worcestershire sauce, and hot sauce. Stir in the pimentos. 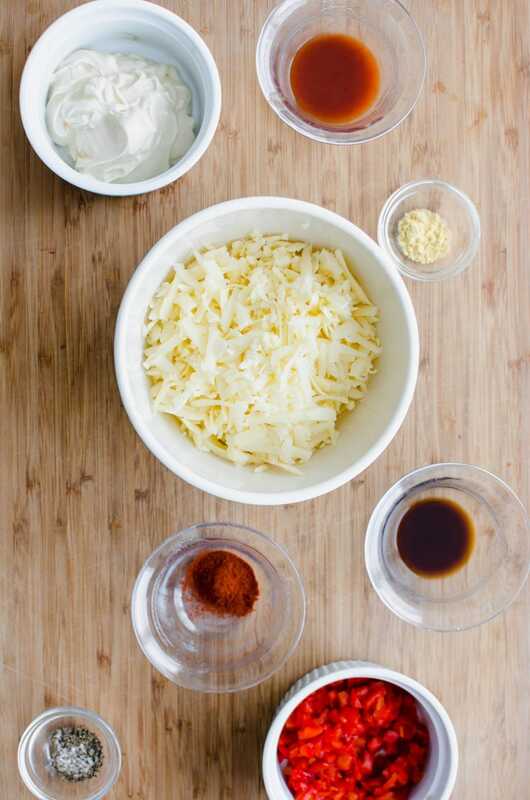 Fold in the grated cheese until the mixture is well incorporated. Place the phyllo tart shells on the baking sheet. Add ½ teaspoon of the strawberry jam to the bottom of each shell. Top with a teaspoon of the pimento cheese mixture. Bake the tartlets for 10 minutes or until golden and bubbly. Remove from heat and transfer to a platter. Serve immediately. 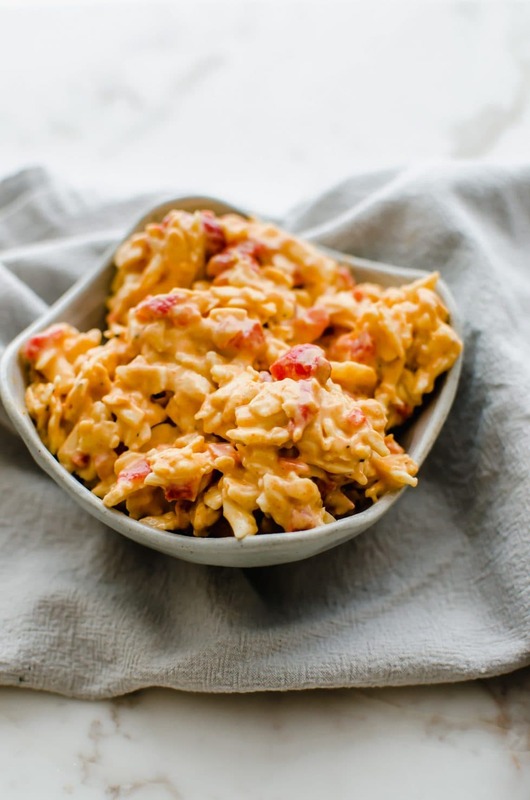 Store the remaining pimento cheese in the refrigerator for up to 1 week. Serve with crackers or on toast! Leftover tartlets can be stored in the refrigerator and reheated at 350℉ for 8 minutes.